The Snippet Designer supports both Visual Studio 2010 and Visual Studio 2008. For the 2008 download please visit the Snippet Designer Codeplex page. A Snippet editor integreated inside of the IDE. It uses the native Visual Studio code editor so that you can write the snippets in the same environment you write your code. It lets you easily mark replacements by a convenient right click menu. 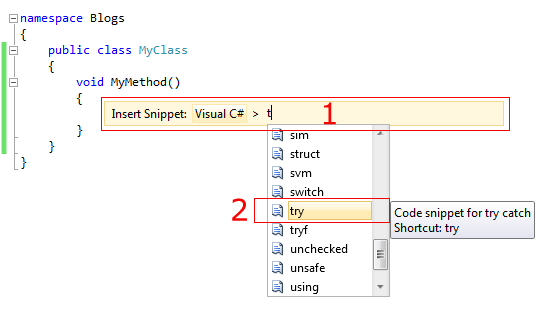 It displays properties of the snippet inside the Visual Studio properties window. This tool window contains a code preview window which lets to peek inside the snippet to see what it is without opening the file. Maintains an index of snippets on your computer for quick searching. Visual Studio 2010’s code snippets stay on the correct side of that line, being nothing more really than some macro expansions that could easily be defined in just about any text editor. If you have to copy-n-paste share, or find yourself writing code that is almost the same (and doesn’t lend itself to code generation) then snippets might be just your thing. They are especially nice if you want to share code/snips with your team. Have you tried R# ones? Restuta, not tried yet. I'm C# developer. Thank you very much, but I just wanted to know your opinion. Do you prefer VS 2010 snippets over ReSharper live ones? Do you use R# at all? Yes, I like re-sharper and have 3 years experience on it. Currently Visual Studio 2010 support almost all snippets from this tool, version 5.1 is really comfortable for code re-factoring, but for writing code VS is forever.